Josh Somes wants to make a difference in the world, but he’s focusing on Cooper- Young first. 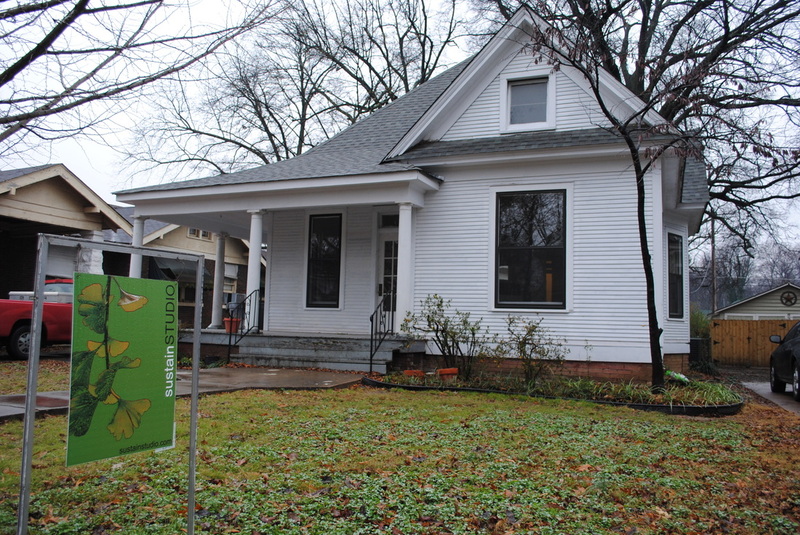 He is responsible for Memphis’ first and only Energy Star remodeled home which will “perform twenty-seven percent better than a new home,” according to Somes. Somes’ innovative renovation seems like commons sense, but it is a new and infrequently practiced idea to “apply sustainability to renovating houses,” he says. It is his goal to inspire people to make green changes to their homes so that they can create a smaller carbon footprint and pay MLGW less. Somes owns a few rental properties in Midtown. While his wife, Deidre, works a full time job as an interior designer, Somes maintains their properties. He recently purchased a home in Cooper-Young with the intention of making it as energy-sustainable as possible. Somes discovered an online Lamplighter article about the Smallest User competition during which Cooper Young and Evergreen residents competed to see who could reduce their energy usage more in 2011. 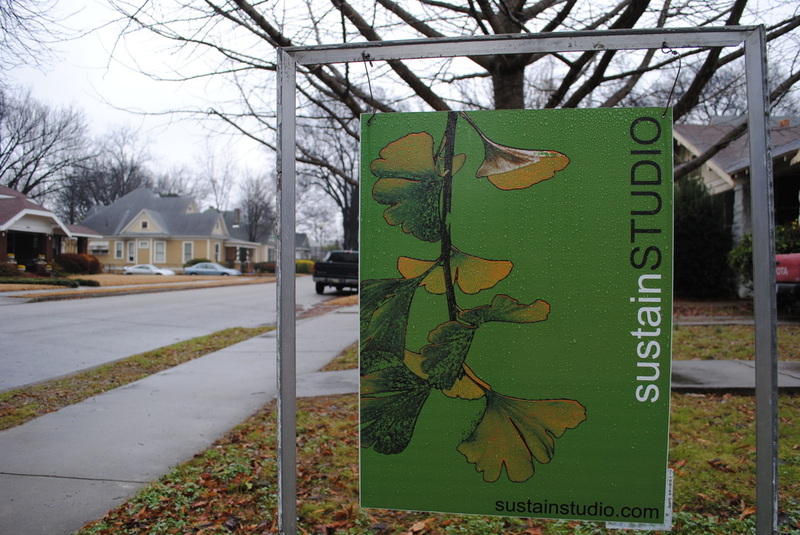 This inspired Somes to create sustainSTUDIO, which designs and builds “residential and small commercial spaces [to promote] sustainability and real solutions to today’s current building practice problems,” according to the website. Somes’ first project is a house located at 2053 Oliver. He has appropriately named this restoration undertaking Project Ginkgo after the tree in the front yard. Somes says this symbolizes a healthy “green” ecosystem growing in accordance with this sustainable home. It's also a fitting symbol for a neighborhood, like Cooper-Young, that is dotted with sculptures/bike racks shaped like Ginkgo leaves. Improving Project Ginkgo’s energy efficiency has been Some’s full-time job for nearly 11 months now. On New Years Eve, Somes received news that his hard work has not been in vain; the restorations made to Project Ginkgo have earned third-party verification through Energy Star. This means that the efforts taken to make the home as energy efficient as possible have paid off. The house received a HERs score of 73; in other words, the house should perform 27% better than a new home that followed all energy codes. Somes resolves to complete the project in Fall 2012 in time to celebrate the homes centennial. One of the most important components to renovating a home for increased sustainability is to improve the insulation of the walls, roof, and attic (referred to as the “envelope”). The Project Ginkgo house was in such poor condition that the plaster had to be removed from the walls in order to spray a layer of insulating foam, put in a layer of insulation, and cover it up with new dry wall. Here are pictures of the progress in his blog. Additionally, Somes removed all three layers of shingles on the roof and replaced the roof with a radiant barrier sheathing. This reflects the sun to prevent the attic from absorbing radiant heat as seen again in his blog. Redesign the entire floor plan so that it suited a modern single family lifestyle. He converted it from a duplex (the style of which he purchased it) into a two bedroom, two bathroom house. Design a more spacious kitchen to have an open space for entertaining. Install flow fixtures, such as the two-button toilet, which reduces the gallons of water from 3.8 to 1.6 when flushed. Change the wiring to suit CFL bulbs with 26 watts, as opposed to the common 100 watt bulbs. Install a water heater recirculation pump. This allows hot water to flow from the faucet instantly instead of wasting roughly 7 gallons water while waiting for it to heat up. “When I first gave tours of the home, people noticed the old phone boxes in the hallway wall. They said it reminded them of their childhood.” Somes removed the old phone boxes, but created a new indention in the wall similar to the phone box and placed the temperature control unit within, applying the nostalgic feature to the home. More energy-efficient renovations to the home seen here. Somes traveled nearly 100 miles round-trip to Holly Springs, Mississippi to gather recycled hardwood for the floors. He also used oak boards discovered in the attic of the house to build an island for the kitchen. 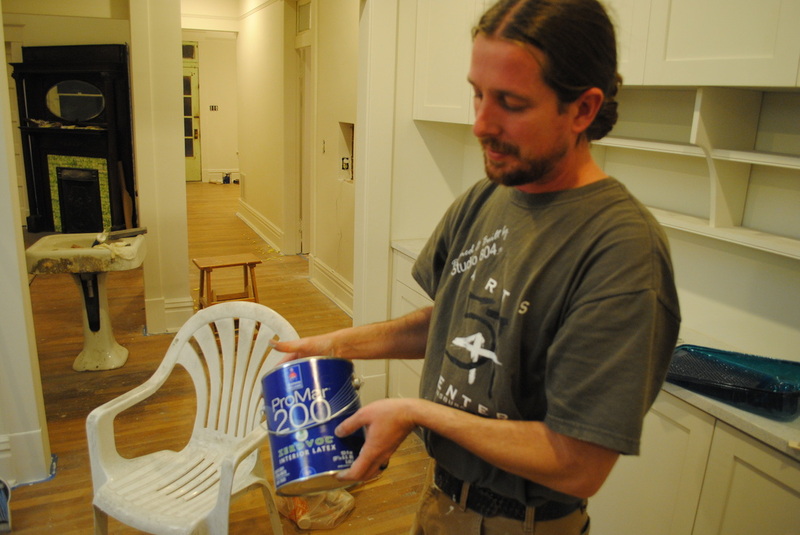 The stains and paint used are chemical-free and water-based to improve the air quality in the home. The kitchen cabinets and shelves are made of man-made quartz and contain a high recycle content with items such as mirrors. Somes using ipad to control the WIFI thermostat, Ecobee. All paint and stains are water-based and chemical-free. Somes is aware that when people hear about changes made to improve energy efficiency, their first thought concerns saving money. He knows that many people want to know just how long they'll have to wait until their lowered energy bills pay off the added expense of green renovation. However, Somes wants to switch these priorities. He wants people to care more about their home’s impact on the environment before they concern themselves with the money they will save. Somes explains that a modern home serves its purpose if it provides both practical protection from the elements and comfort. Technology has allowed us to include many features to ensure our comfort, such as lighting, heating, air conditioning, indoor plumbing, and kitchen appliances. But the problem is that when the majority of modern homes use these features, they waste an alarming amount of energy (and consequently, money). Somes wants to address this issue by linking comfort and feasibility through Project Ginkgo’s sustainability renovations. He has taken advantage of smarter and more scrupulous technology as a better way to “build” the future. Somes is uncertain about whether or not he will earn back the money he has put into the home, given today's poor housing market. But recouping his investment is not Somes’ primary goal. He simply wanted to make renovations to the house so that it became an asset to the Cooper-Young neighborhood. 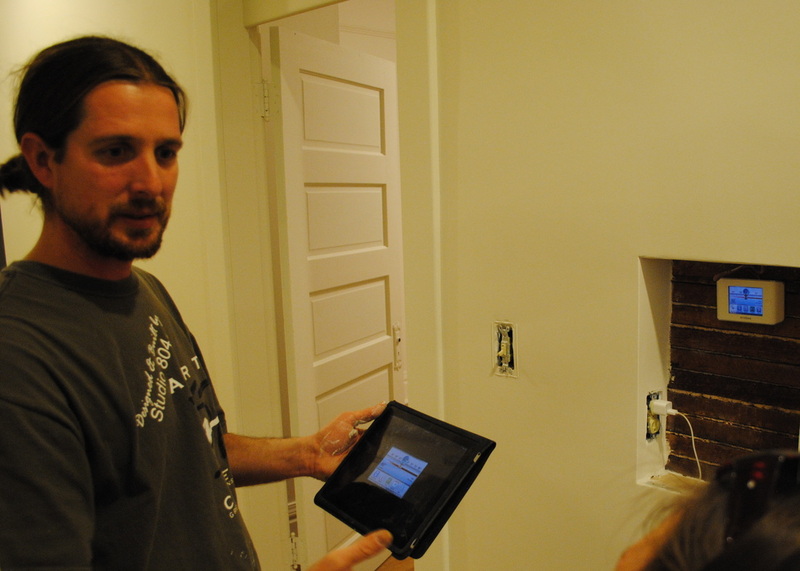 Project Ginkgo will be the test to see how he will renovate houses in the future. Somes wants homeowners and builders to care about a building’s impact on the ecological system, whether it be your home, your neighbor’s home, or Kermit the Frog’s home on Not Easy Being Green Street; Somes hopes to add to the conversation about homeowner thinking and builder practices to sustain and build greener homes. Somes will hold a showcase in mid-February to talk to anyone interested in improving the energy-efficiency of their home. Lindsey Lowry covered residential living for MicroMemphis for Spring 2012. Send MicroMemphis story ideas here. Follow Lindsey on Twitter @lnlowry.